I often hear teachers stressing out about how they can get everything they need ready for all their book groups, standards-based grading, and so on. Sometimes I think we work WAY too hard–and I always work to try to do best quality instruction without driving myself into the ground. 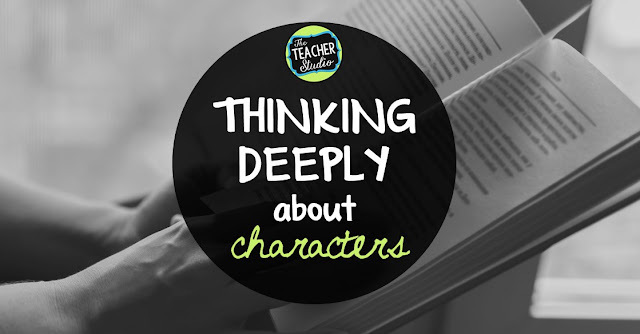 We focus on characters throughout the school year. The easiest way I do this is that I have a bank of resources ready to go–and I use the gradual release of responsibility to do so. One of the topics we cover throughout the year involves studying “character”. This is a part of the Common Core and other state standards…and it’s such a great way to kick off the year because we can find SO many texts where characters are relatable. 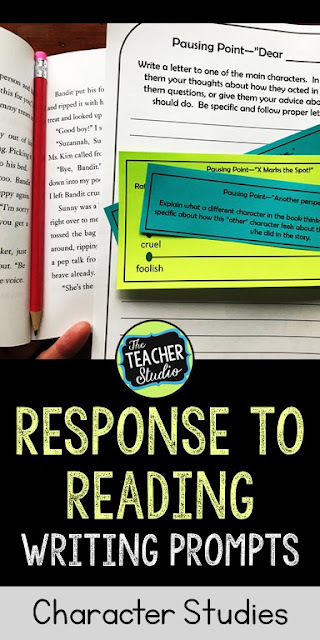 Picture books with strong characters, amazing read alouds, book groups where books are chosen because of their strong characters…all are super easy ways to get the discussions going. I spend a HUGE amount of time modeling my thinking about characters. This includes introducing character traits, tracing our thinking on anchor charts, and–eventually–modeling writing about characters. I think by doing all this legwork ahead of time makes it so much easier for students to understand what “deep thinking” really looks like. It helps push them beyond those “just right” ideas. It’s also a great way to model that “evidence from the text” that is such an important part of helping students write about characters. I model thinking and writing about books with picture books and read alouds. Students write about these shared texts as well–before they write about their own texts. I have students share their writing with each other and practice giving feedback. The “gradual release” is critical so students see what to do, how to do it, and the level of depth I expect in their reflections. I keep writing samples from earlier in the year for students to look back at later to check for improvement. We “study” samples of student writing to get better at our own. I collect samples as part of our assessment process. As the year goes on, students start to write about characters for the books they are reading in book clubs or independently. We look at all elements of “character”…from traits, to how they change, to their quotations, and more. Sometimes we write in our notebooks and sometimes on separate sheets that I can keep to use as data points. If you are interested in seeing some of the prompts I use, just CLICK BELOW! 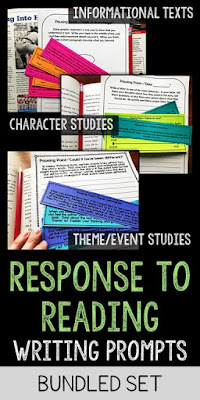 I use the same type of prompts as we study theme, events, and informational text as well. Here is a link to the prompts I use to help with that! Want to pin this for later? Here you go!